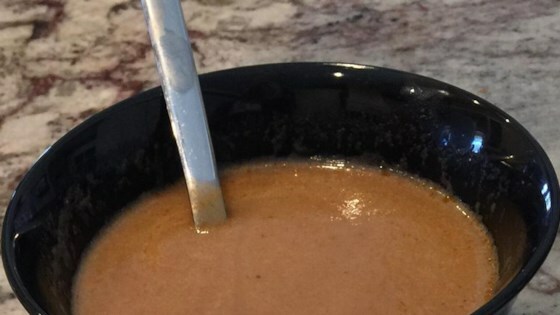 "This soup has a smooth texture and a light taste; it's well worth the effort. I remember my grandmother preparing it, filling the whole house with the smell of roasted garlic..."
Bake in preheated oven until the garlic has turned golden brown and the eggplant is tender, 30 to 40 minutes. Allow to cool until cool enough to handle. Peel eggplant and chop into large chunks; peel or squeeze the roasted garlic from its skin, and set aside. Heat 1 tablespoon olive oil in a large saucepan over medium heat. Stir in onion, and cook until soft and translucent, about 5 minutes. Pour in chicken broth, then stir in reserved eggplant, roasted garlic, tomato puree, and cayenne pepper. Bring to a boil over medium-high heat, then reduce heat to medium-low, cover, and simmer for 40 minutes. Once cooked, carefully puree soup in batches in a blender or food processor until smooth. Return soup to the stove in a clean saucepan. Stir in half-and-half, season to taste with salt and pepper; cook over medium-low heat until hot. I found the soup bland and unappetizing looking due to the color. It would be better as a soup base instead of as is. Made it today and turned out great! I don't have a processor so I just diced the eggplant after roasting. Also added sliced baby red potatoes. Filling and has nice sweet garlic flavour! It looks pretty gross but tastes great.